In 1939 the Imperial Japanese Navy drew up its specification for a carrier-based torpedo-bomber to supersede the Nakajima B5N. The specifications issued by the navy called for very modern characteristics. A maximum speed of 288 mph (463 km/h), a cruising speed of 230 mph (370 km/h) and a range of 1,000 nautical miles (3335 km) without a bombload. 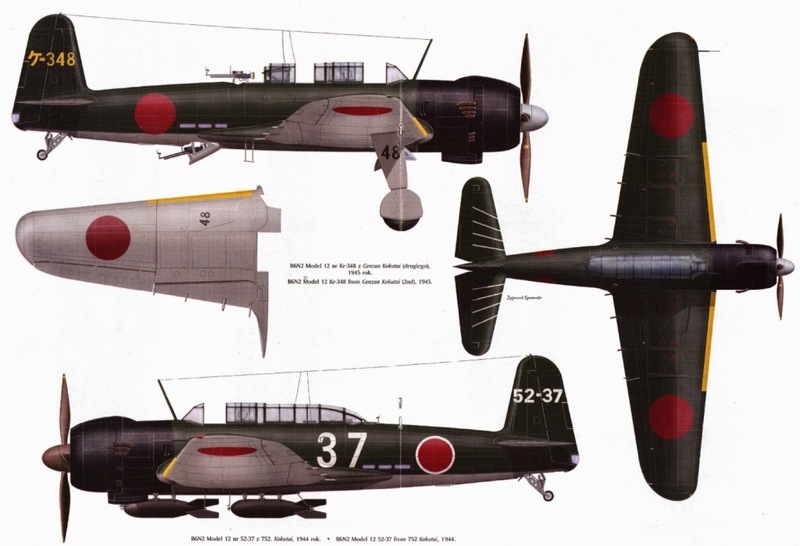 To meet the requirement, Nakajima decided to use an airframe very similar to that of the earlier aircraft, differing primarily in its vertical tail surfaces. 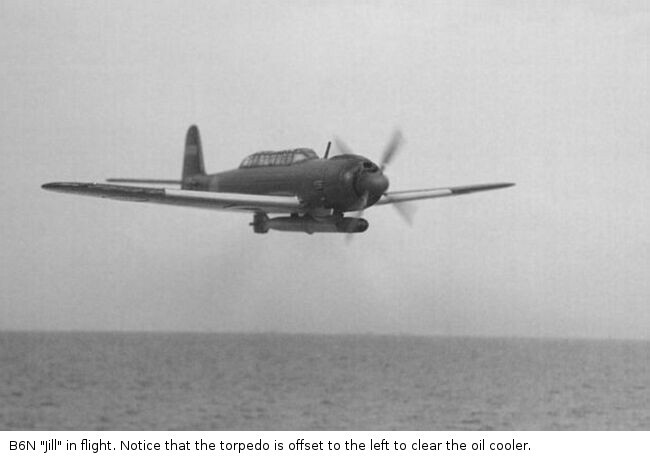 The navy had specified use of the Mitsubishi Kasei radial engine, but Nakajima decided to use instead its own 1,870 hp (1395 kW) Nakajima NK7A Mamoru 11 radial engine of similar output driving a four bladed Hamilton type propeller. The first of two prototypes was flown in spring 1941, but initial flight testing revealed a number of problems, including engine vibration and overheating, but the most serious was that of directional stability, requiring revised vertical tail surfaces. Final flight testing carried out aboard the aircraft carriers Ryuho and Zuikaku in the end of 1942, revealed further problems with the tuning of the engine and the need to reinforce the arrester hook and landing gear. It was not until February 1943 that the type entered production as the Navy Carrier Attack Bomber Tenzan Model 11, company designation Nakajima B6N1, incorporating a number of refinements as a result of extended flight testing. However, after only 135 production Tenzan (heavenly mountain) aircraft had been delivered a new crisis arose when Nakajima was ordered to terminate manufacture of the Mamoru engine, and use the more reliable 1,850 hp (1380 kW) Mitsubishi MK4T Kasei 25 engine, a step also taken to allow greater emphasis to be placed on production of the widely-used Nakajima Homare and Sakae engines. The company was now compelled to use the engine which the navy had specified originally, the Mitsubishi Kasei, but fortunately the adaptation of the B6N airframe to accept this powerplant presented no major difficulties. The resulting aircraft, which was also the major production version, had the designation B6N2 and differed only from the B6N1 by the installation of the Mitsubishi Kasei 25 engine. The B6N2a variant had the rear-firing 7.7 mm (0.303 in) machine-gun replaced by one of 13 mm (0.51 in) calibre. When production ended, Nakajima had built a total of 1,268 B6Ns of all versions, this number including two modified B6N2 airframes which had served as prototypes for a proposed land-based B6N3 Model 13. The powerplant had been the improved 1,850 hp (1380 kW) Mitsubishi MK4T-C 25C version of the Kasei engine and the strengthened landing gear had larger wheels for operation from unprepared runways, but production did not start before the war ended. 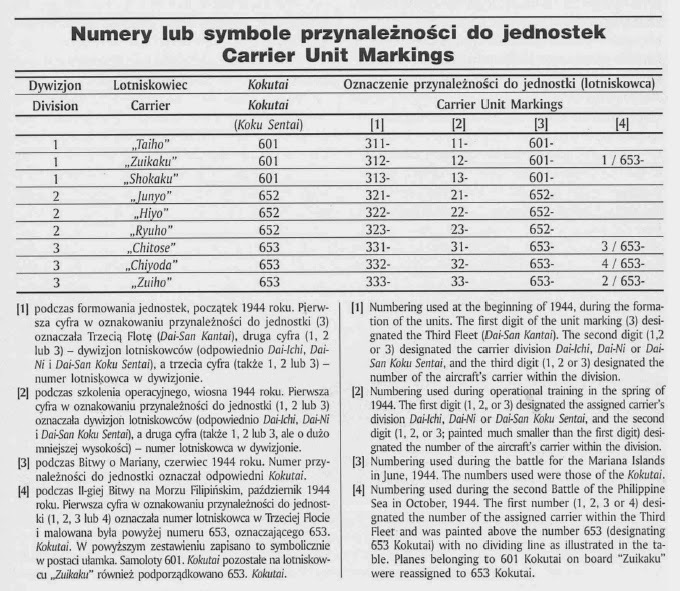 Allocated the Allied codename ‘Jill’, the B6Ns saw intensive use during the last two years of the war for conventional carrier operations and, in the latter stages, in kamikaze roles. Nakajima B6N2 – Nakajima was ordered to cease using the Mamoru engine and use instead the Mitsubishi Kasei 25 engine, thus resulting in the redesignated B6N2. Although the Kasei 25 was slightly less powerful, this was offset by introducing a less drag version of the exhaust ports which also gave a slight jet-thrust like boost effect. 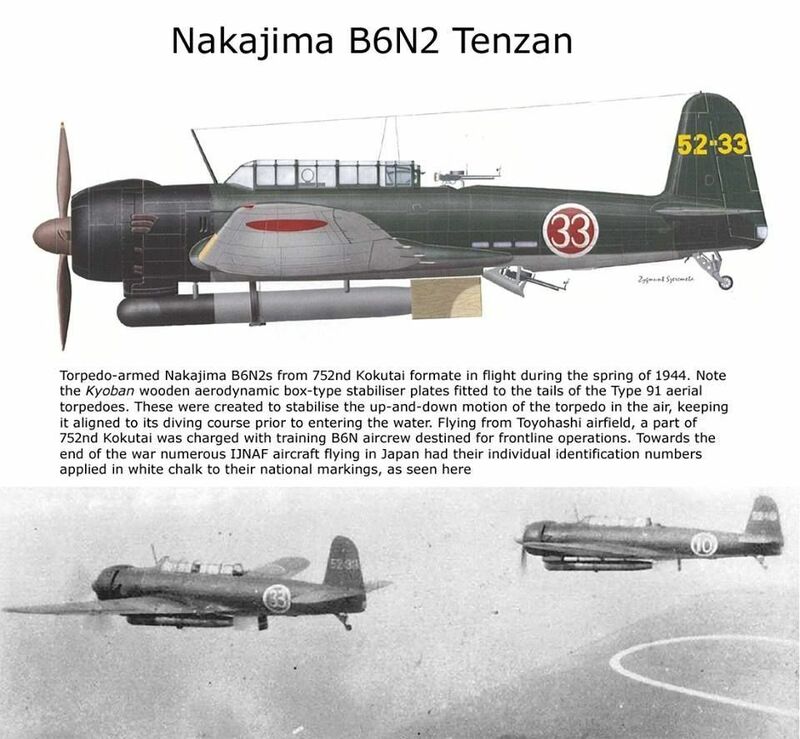 Nakajima B6N2a – This type differed from the B6N2 only by having a rear firing machine gun of 13 mm (0.51 in) calibre, instead of the 7.7 mm (0.303 in) type used on the B6N2. Nakajima B6N3 – Two conversions of the B6N2a resulted in the B6N3 prototypes equipped with 1,850 hp (1380 kW) Mitsubishi MK4T-C Kasei 25C engines for evaluation as land based bombers. Powerplant: (B6N1) One 1,870 hp (1395 kW) Nakajima NK7A Mamoru 11 14-cylinder radial engine. (B6N2) One 1,850 hp (1380 kW) Mitsubishi MK4T Kasei 25 14-cylinder radial engine. (B6N3) One 1,850 hp (1380 kW) Mitsubishi MK4T-C Kasei 25C 14-cylinder radial engine. Performance: Maximum speed 298 mph (480 km/h); service ceiling 29,660 ft (9040 m); initial climb rate 1,885 ft (575 m) per minute. Range: Normal 1,084 miles (1745 km); Maximum (overload) 1,892 miles (3045 km) on internal fuel. Weight: Empty 6,635 lbs (3010 kg) with a maximum take-off weight of 12,456 lbs (5650 kg). Dimensions: Span 48 ft 10 1/2 in (14.90 m); length 35 ft 8 in (10.87 m); height 12 ft 5 1/2 in (3.80 m); wing area 400.42 sq ft (37.20 sq m). Armament: One 7.7 mm (0.303 in) Type 98 machine gun manually aimed from rear cockpit and one manually aimed by middle crew member from rear ventral position and one fixed 7.7 mm (0.303 in) Type 98 machine gun in left wing (often absent from the B6N1). A 1,764 lbs (800 kg) 18 inch torpedo carried offset to the right of centreline, or six 220 lbs (100 kg) bombs carried under the fuselage. Variants: B6N1 (Mamoru engined), B6N2 (Kasei engined), B6N2a, B6N3 (prototypes for land based version). Avionics: Some later models were equipped with ASV radar for night operations. History: First flight March 1941; service delivery (B6N1) early 1943; service delivery (B6N2) December 1943. Operators: Japan (Imperial Japanese Navy). This entry was posted in Aircraft, Japan, Naval by MSW. Bookmark the permalink.